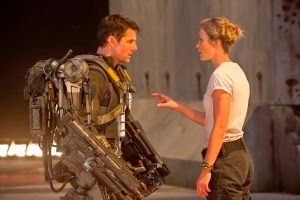 For breathlessly fast-paced, inventive summer fun, Edge of Tomorrow is a winner. After last year’s ponderous sci-fi drama Oblivion, Tom Cruise is firmly back in action mode with a performance that playfully tweaks his uber-confident hero persona. 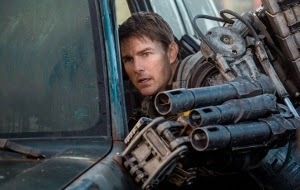 Cruise plays yellow-bellied military PR agent Major William Cage, responsible for selling an unwinnable war to the public. It’s the near future and Earth is under attack by relentless octopus-like aliens known as “mimics.” Cage’s world is turned inside-out when General Brigham (Brendan Gleeson) orders him to the front lines of a Normandy invasion that parallels WWII’s D-Day. Completely untrained for combat, Cage quickly meets a very bad end after managing a lucky shot that takes down a so-called “Alpha” mimic. Initial trailers advertising the film struggled to effectively convey the concept, as if even the studio was worried about revealing too much. Though the trailers were eventually retooled to positive effect, it seemed that the damage had already been done: the movie was generating very little buzz. Don’t let that deter you. Director Doug Limon (The Bourne Identity, Mr. & Mrs. Smith) keeps the action humming along, infusing the action with so much pulse-racing excitement that you don’t even have time to look for plot holes. Screenwriters Christopher McQuarrie and Jez & John-Henry Butterworth adapted Edge from Hiroshi Sakurazaka’s novel All You Need is Kill. Having not read the book, I’ve no idea how faithful it is. But it’s worth pointing out that the movie isn’t terribly original. Besides the most obvious point of reference (the aforementioned Groundhog Day), various elements recall everything from Saving Private Ryan to Starship Troopers to more recent sci-fi fare like Pacific Rim and Looper. The latter even shares a co-star with Edge: the terrific Emily Blunt. Here Blunt plays the consummate soldier Rita Vrataski, a combat soldier regarded as royalty for her uncanny ability to battle mimics. There is, of course, a reason for that – finding out is integral to the fun of Edge. Cruise and Blunt make a great team as Cage and Vrataski meet for the first time – over and over again – as they piece together the puzzle. To whatever degree various elements might, at face value, seem recycled Limon and company stitch them together in an excitingly fresh way. The whole contraption seems to have sprung from the mind of a particularly inspired gamer. It’s as if we’re watching someone play a video game that keeps sending Cage back to a naggingly fixed ‘save point.’ That same level has to be replayed, no matter how far Cage gets in his struggle to uncover the secrets of the mimics. The prospect of repeatedly seeing Cage get chewed out by Master Sergeant Farrell Bartolome (Bill Paxton, clearly having a blast), meeting and re-meeting his J-Squad troop members (hostile toward him when Bartolome introduces him as a deserter), and fight the same fights might sound like a tedious bore. But it never is, largely thanks to an abundant sense of humor firmly embedded within all the repetition. The pacing never lets up, ensuring Edge is considerably more involving than the idea of watching someone re-play the same level of a video game. 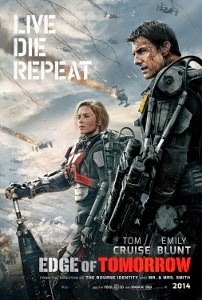 For killer summer escapism, Edge of Tomorrow is one crowd pleaser that should not be missed. And be sure to get inside the theater on time because (more so than the average movie) you’ll be lost if you miss even the first five minutes.